Did I say something wrong? After eating these guys took off and didn’t stay for any after dinner chitchat. This photo was taken in Chobe National Park in the late afternoon about an hour before sunset. This entry was posted in Africa, Travel Photos and tagged Africa, Botswana, Chobe National Park, Elephants, Nature, Photography, Photos, Travel, Travel Blog, Travel Journal, Travel Photo, Travel Photos, Wildlife. Bookmark the permalink. 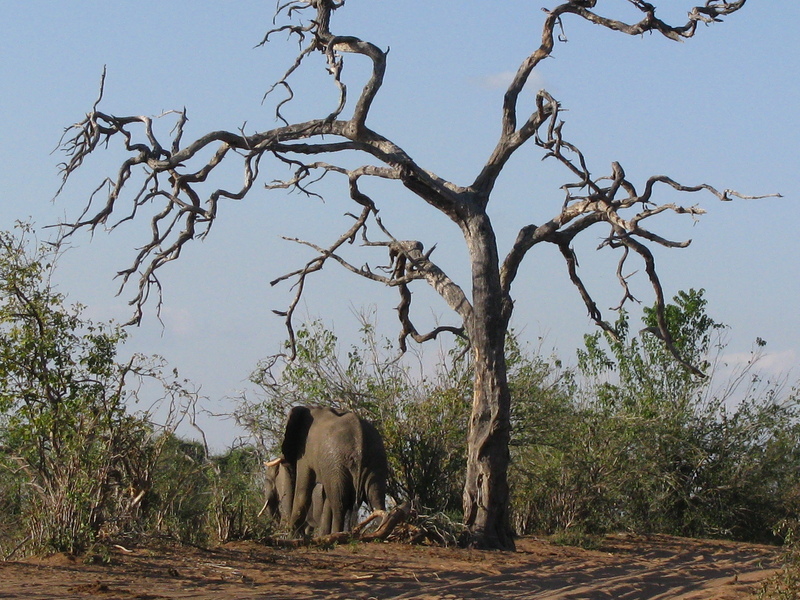 I love this image, especially the way the tree frames the elephants. Like your caption too. lol! I loved seeing those trees…they just have a story to tell. Thanks Robin! Wow, the elephants are cute, but that is the coolest tree ever. It has such character!! I wish that tree could talk! Beautiful shot. I love me some elephants. This is a marvelous photo. Elephants are big but how huge is this dead tree!? It is huge…and full of life even though it doesn’t look it. You wouldn’t say that it is still alive! Not still growing…but I think there is something there in this tree…I guess I think it has a lot of history and I would love to know its story. Camera shy – and that’s an interesting rear view shot. Really cool! That tree is really intriguing. It looks like it would be spooky in the dark with all its crooked branches. They look like long crooked fingers reaching out to grab something. The tree would make a great evil villain in a story. I hope there is a next time. I’m itching to get back to Africa. They must have taken a short nap before another meal time. hehehe. 🙂 you have great models for your photos! either they are unwilling to pose or they avoid any kind of conversation. so much for the art and science of making small talk.